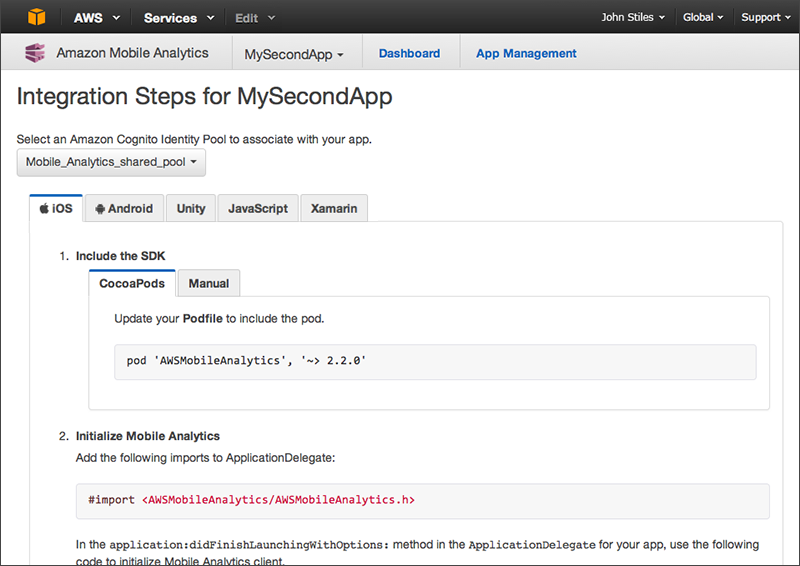 Mobile Analytics helps you integrate the service into the source code for your app. It provides blocks of code you can copy and paste into your source code as well as information about where in your app to add it. Where an integration step requires it, the code includes the appID to connect the data sent by the app to Mobile Analytics for generating reports and stats. From the Dashboard, choose Manage Apps in the application list in the toolbar. In the Manage Apps list, choose View Integration Steps next to the app whose details you want to view. If you have additional non-default identity pools, you can change the identity pool associated with this app. Simply choose it from the drop-down menu.